Did Delta Air Lines Turn a Protest Into an Opportunity? Legislation in the form of a bill called House Bill 821 calls for the amendment of Title 48 of the Official Code of Georgia Annotated, which — if passed — will essentially eliminate the sales and use taxes levied on jet fuel for all airlines which purchase fuel in the state of Georgia; and greater than 800 students arrived at the world headquarters of Delta Air Lines yesterday, Tuesday, February 13, 2018 at 10:30 in the morning to protest. With the busiest airport in the world as its hub in Atlanta, Delta Air Lines stands to benefit the most from this legislation if it becomes law — and public schools could potentially be amongst the biggest losers as a result. Currently, airlines are taxed on jet fuel in the forms of sales and use taxes for both the state of Georgia and Clayton County — in which the international airport which serves the greater Atlanta metropolitan area resides — pursuant to the County Special Purpose Local Option Sales Tax, the Sales Tax for Educational Purposes, the Special District Transportation Sales and Use Tax, and the Special District Mass Transportation Sales and Use Tax. If airlines are exempt from paying those taxes, Clayton County is expected to lose a significant amount of revenue. As sanctioned by officials of Clayton County Public Schools in what they called “experiential learning”, the students skipped school for the day; boarded 18 school buses; and participated in a demonstration at the world headquarters of Delta Air Lines. Georgia currently enjoys revenue of approximately $35 million per year as a result of the jet fuel tax burden on airlines — which is the eighth-highest in the United States. The elimination of the tax means that that revenue disappears while Delta Air Lines simultaneously could save millions of dollars on jet fuel taxes. Nathan Deal. Photograph ©2014 by Brian Cohen. Apparently, residents, students and school officials in Clayton County beg to differ with that assessment. Forces are “trying to railroad HB 821 through in order to achieve their goal”, said Morcease Beasley — who is the superintendent of Clayton County Public Schools — according to this article written by Heather Middleton of Clayton News-Daily. “He added if the bill passes it would void the county’s petition with the courts” in reference to a lawsuit which Clayton County filed against the Federal Aviation Administration of the United States, which ruled back in December of 2014 that jet fuel tax revenues must be used for airports rather than for other purposes — such as roads or schools, for example. Was Aungelique Proctor correct when she reported that “Delta Air Lines seemed to quickly turn the protest into an opportunity”, as she said in the video shown above? If so, was this a clever marketing and public relations technique implemented by Delta Air Lines — or was it an unethical attempt at diverting the main issue at hand? 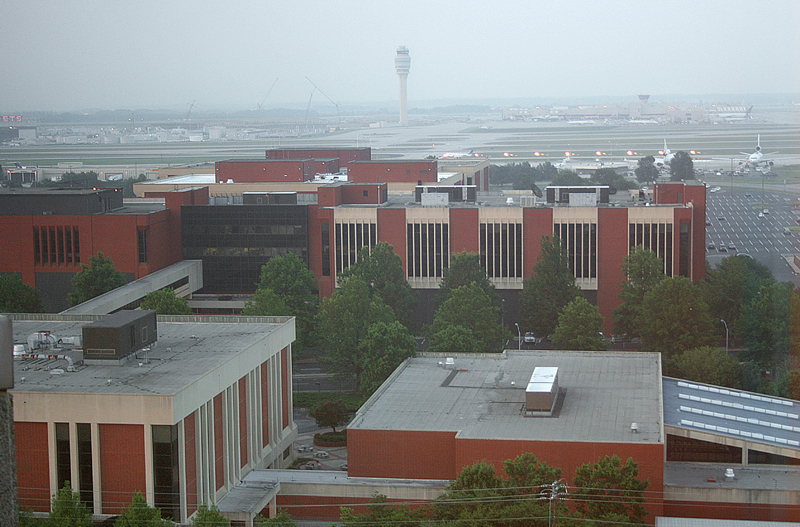 The main campus of the world headquarters of Delta Air Lines in Atlanta. All photographs ©2009 and ©2014 by Brian Cohen. Sounds like the taxpayers will be forced to pony up instead of Delta. It’s a joke that this would make more flights to ATL. It’s already one of the busiest airports in the entire world.